As I’ve mentioned before, I’ve been slowly trying to get my crafting supplies, partial projects, and completed projects organized so I can actually find what I’m looking for in less than 20 minutes. 🙂 Well, when my mom was visiting last month, she brought with her the instructions for a great project. 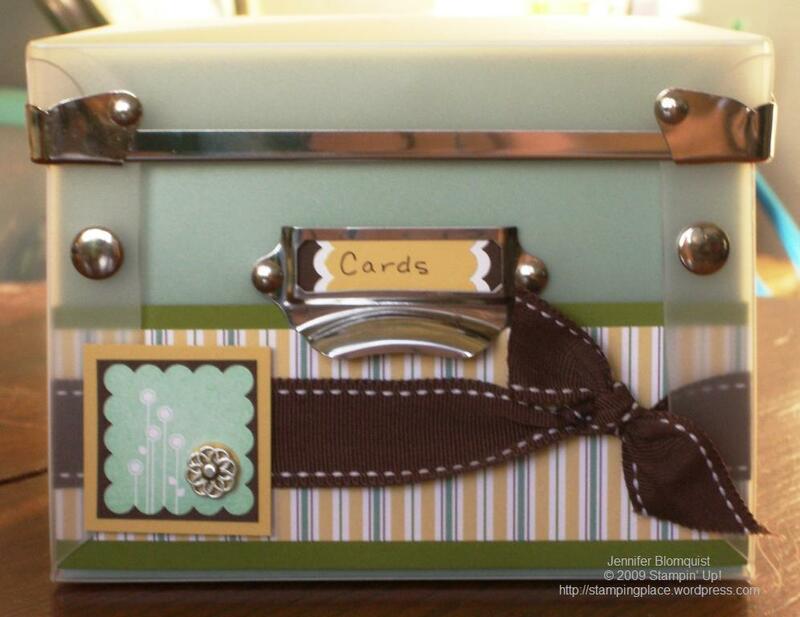 Using the Forget-me-not keeper from Stampin Up!, we created a decorated box and inserts for storing all of the cards you need to send out in a year. Now, first I don’t know how many of you out there had seen this box in the SU catalog and were like me and thought, ” that looks just like the photo boxes you get at Michaels only in plastic”. Well, it took me ordering one to realize they are totally different, and the SU box is way cooler! 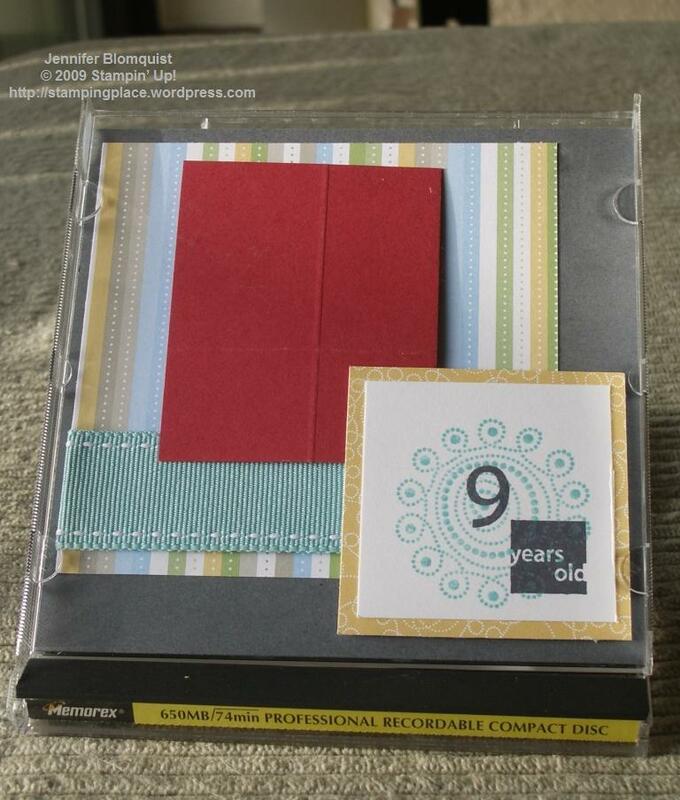 Turns out, the boxes you get at craft stores really are made for photos and so are not quite tall enough for your standard 5.5 x 4.25 cards to be placed inside and still have the lid close completely. The SU box is made to fit cards perfectly, plus it comes with 12 plastic inserts to help you organize the cards you make. 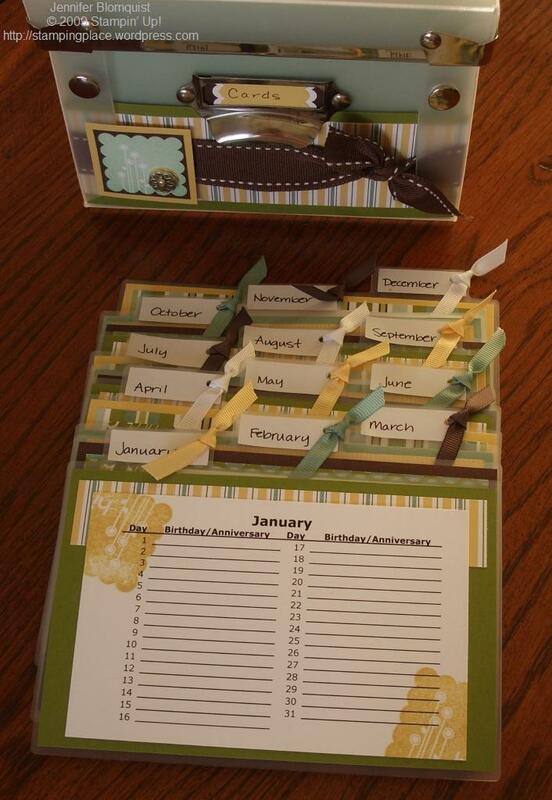 In our case, we used those inserts for each month. So, now I’m totally a convert to these boxes. They pack flat and then go together in a jiffy and actually fit my cards. So, we placed a piece of cardstock on the inside of the box behind the the front panel to add some color and then used designer paper and ribbon to decorate the frontside. One note if you are going to decorate one of these boxes yourself. Definately use the red sticky strip. The plastic has a slight texture to it, and the sticky strip really locks the paper to the plastic. For each of the inserts, we printed out a piece of paper with the month dates on it to fill out who needs a card and for why. 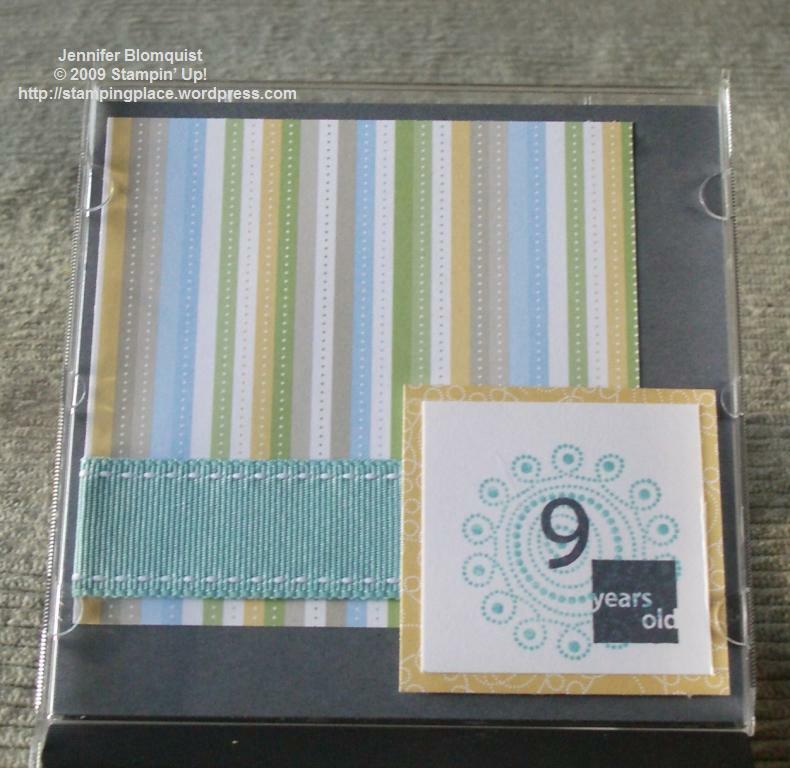 We used the So Many Scallops stamp set for all of the stamping in this project and the crop–a-dile made punching a hole in the tabs for the ribbon soo easy. Really the thing that I think makes the crop-a-dile a must have is how it makes punching thick and hard materials like you were punching through paper. I’ve punch metal and chipboard and now thick plastic. So, I’m realizing that I’m now of the age that wedding seasons are winding down and its baby time for many of my friends. Over the last month or two, I’ve learned that at least 5 friends are pregnant with most of their due dates being later this summer and fall. I’m so excited for all of them and am looking forward to having lots of cute little babies to play with. Yesterday was the first of a number of baby showers and so I needed a card to go with my gift. Of course, I waited until the last minute to put it together so I was rushing the morning of our drive to Seattle to put one together. If you can’t guess, we learned that our friends were having a girl so I had to go with the pink theme and this Bella Rose designer paper seemed to fit the bill. I pulled out my old baby stamp set for the stamp set and went from there. If I had more time I would have colored in the teddy bear but I think it works as is. The other fun bit I did was to take a pretty in pink brad and wrap the tines around the knot in my taffeta bow to make the pink center. It was a little hard to get started but I think it adds a fun bit of color to the ribbon. The baby shower ended up being lots of fun. Since it was a co-ed shower, my hubby came with me and we had a chance to catch up with a number of friends that we haven’t seen in over a year. Hopefully now that we live closer to Seattle (and I seem to drive up there all the time) we will see them more. I was wondering what kind of game they might play at a co-ed shower and it turns out they put together a game of Life (like the board game) using pieces of paper taped to the floor. At one point you have to either go down the kids or no kids path based on if you have kids or not. I made it through the no kids path first and the last square was labeled “suprise”. I was told to flip up the paper and read the suprise. Turns out the suprise is you are accidentally pregnant and get to go back to the start of the kids path. We all laughed and said of course, its a baby shower so everyone has kids in this game. 🙂 And the honored mom-to-be won the game so it turned out perfect. What a whirlwind spring! There have been tons of family visits, stamping events, and work deadlines. That has kept me away from my computer as much as normal but also means I have a backlog of great things to show you! And my SCS blogging group, sorry I’ve been away so long but I’m back and will be visiting your blogs very soon! This is a photo frame we did using a CD case as the holder. All you have to do is pop the cover off of the case and then rotate the cover so it would stand up if the cd case base was on the table. Pop the cover back on and then slide in your decorated background. In the second picture, I didn’t have a photo printed out to put in the frame, so I put a red piece of card stock in to show you how you don’t glue down the top left corner so it can sit over your photo. 🙂 Its easy, peasy! While I work on getting pictures taken and up from my most recent project, I thought I would mention here on my blog my next class which is happening this weekend in downtown Portland. I’m hosting a Mom and Me event where you and your child (or you and your mom or you and your inner child), can come do some stamping techniques together. 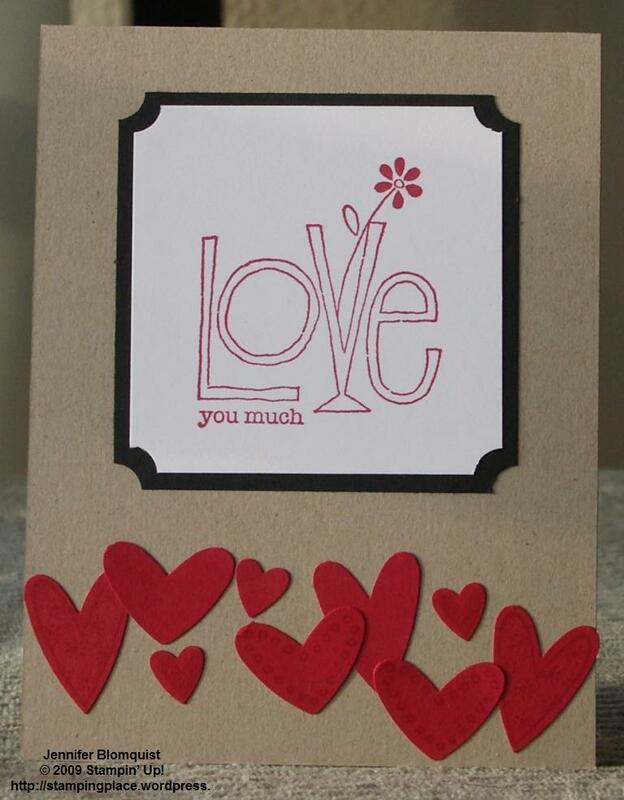 I’ll have a few cards/projects available for you to do together and in a fun family setting. Cost is $12 per family or $8 for individuals. I’d love to have you join our group for this event! Email me to save your spot! And for those of you from far away who can’t make it, I promise to post pictures after the fact. 🙂 Craft from home at the same time and it will be like tele-crafting. Also, don’t forget you only have a couple more weeks left of Sale-a-bration time! 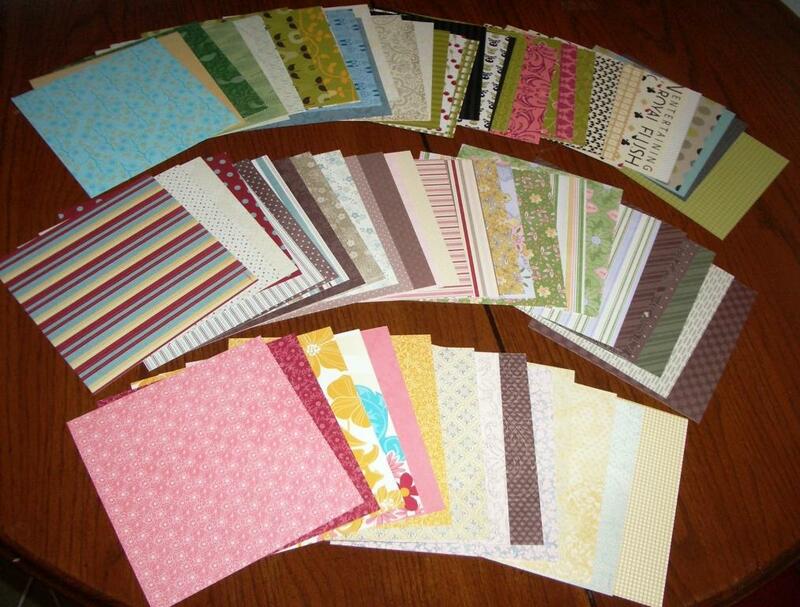 Every $50 you spend equals an extra stamp set, ribbon, or paper pack. Like free stamps? Right now, I’m offering the next 3 people who book a workshop will get a free stamp set on the day of your show. Yep, its free just for hosting! Contact me today to take advantage of this special offer! Late last week, my mom came up for a visit (a week after my MIL was here for a week visiting!) She was in town to join me at the Creating Keepsakes big scrapbooking convention in Portland this last weekend. The convention was an absolute blast and we stayed up waay to late Saturday night at the crop and then having our own after-hours crop back at my house. 🙂 We had a great time over the weekend and between our projects at home and the projects we made from the classes at the convention, I have lots of cool things to show you this week. I’ll be trying to get to pictures taken of the projects and posted this week. Late last week, the paper came in for my paper samplers and so I got to go through all of it when I was cutting it to 6×6 sheets. 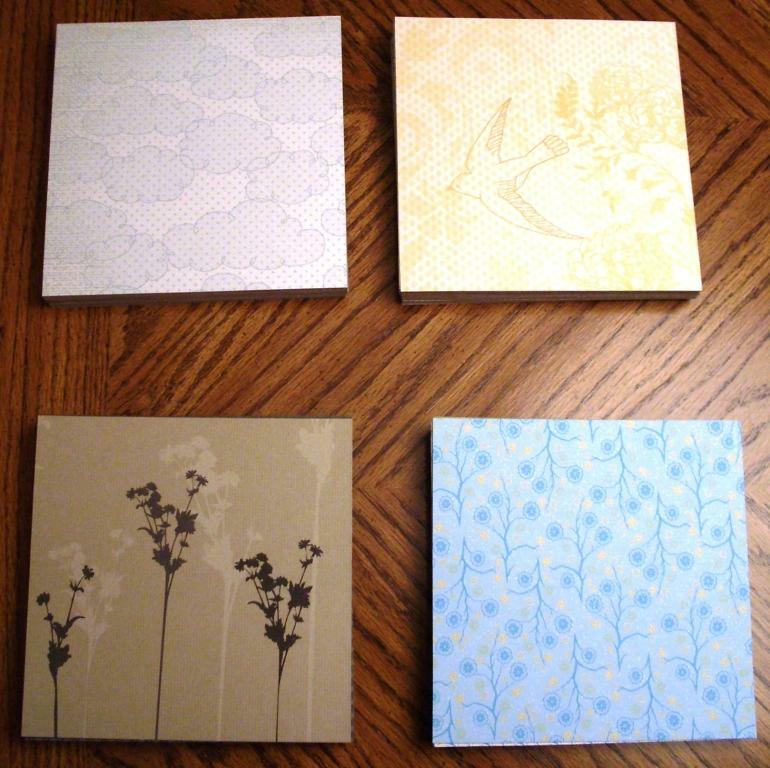 I have to say, there is some really cute paper! I have a few now on my wishlist that I didn’t have on there before (Flock Together anyone? 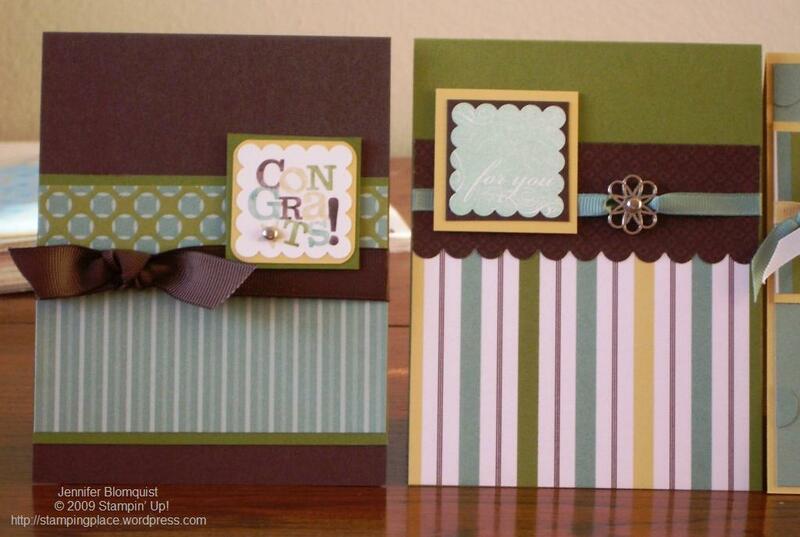 Textured designer paper!) I still have a couple left, so if you want one, email me and I can get one out to you! Finally, when my mom was here, she wanted to try out the pastel techniques we did at our technique night last week. 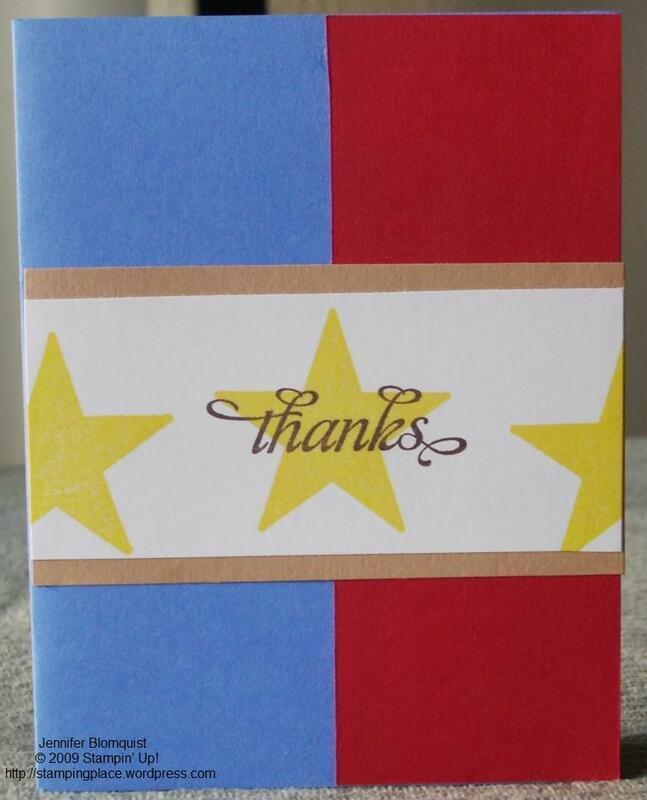 So, while showing her how to use pastels to color an embossed image and color ribbon, I made a quick thank you card for one of the ladies who purchased one of the paper samplers. This time I played with layering multiple pastel colors on an image. I only used a little but it makes such a nice blended effect that you could get more complicated and make some beautiful designs. ahhh… it feels good to back at the blog. I just getting over a yucky cold and just in time because my technique night was last night. We were playing with pastel chalks and between my cold and my half-cleaned craft room, I got a bit of a late start preparing for it. However, I’m happy to report that I’ve made huge progress on my craft room (you can now fit chairs at the table and the table is cleaned off for the first time since moving here last fall :))! Of course, in the process of prepping for the class last night, my craft table is a mess… so I get that straightened up and share it with you. But in the meantime, I thought I’d share what I whipped up as samples for some different techniques. This was actually my first time in a long time that I had used my chalks and I discovered they are a lot more fun than I remembered. And the girls did some awesome work with them – I just need to remember to take pictures of what they create! 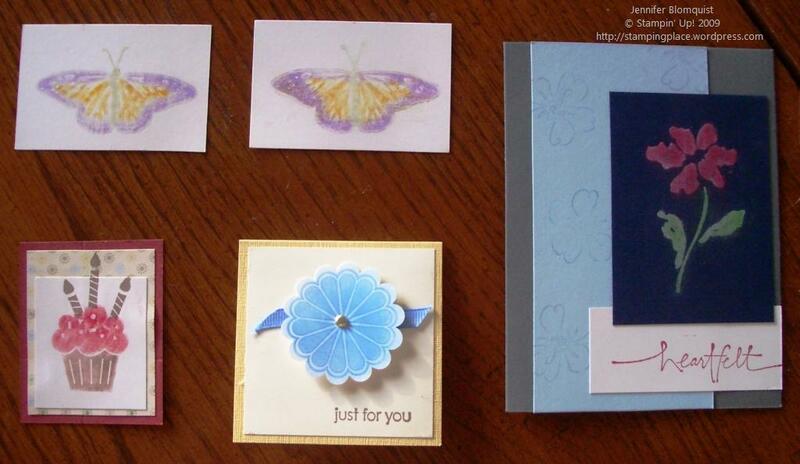 The techniques we focused on were popping pastels (the cupcake and the butterflies), coloring an embossed image (the blue scalloped flower), coloring ribbon (the blue ribbon), chalkboard technique (the red flower), and using chalks directly on the stamp to color a stamped image (some of the background flowers on the heartfelt card). 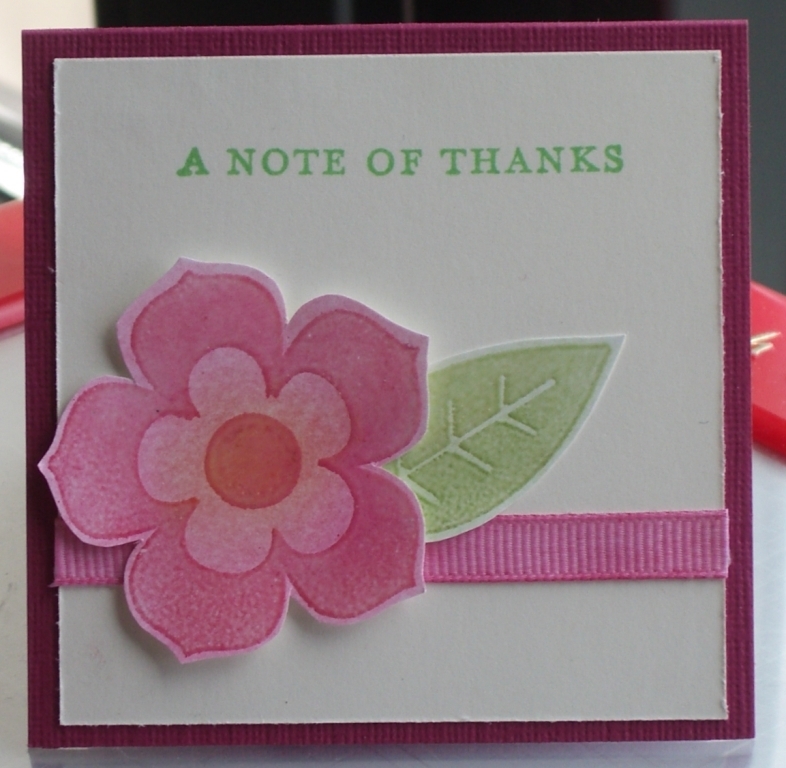 The flower started out as clear embossing powder over versamark on whisper white paper. 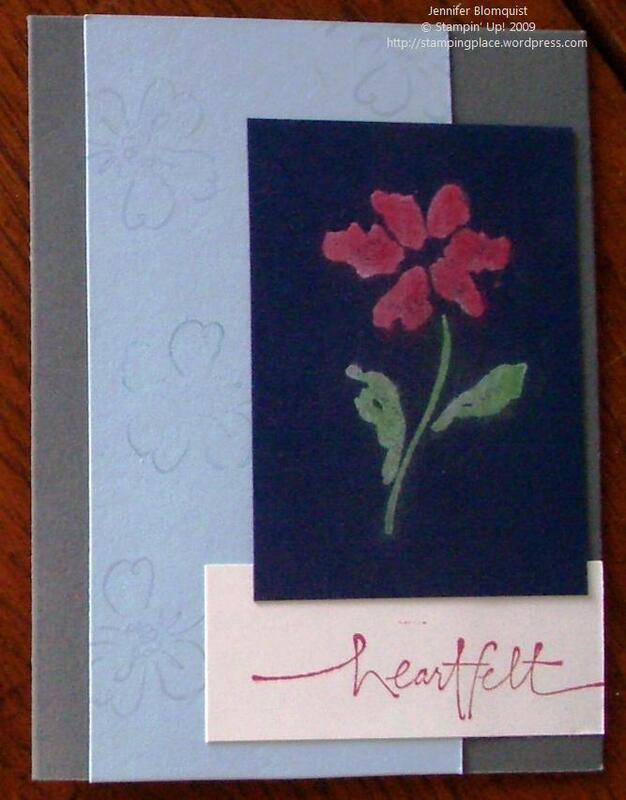 After you have embossed your flower, you can take a sponge to your chalk to pick up some color and then rub the sponge over the embossed image to color it. I recommend using brighter colors though because my first attempt with a light blue barely showed up. 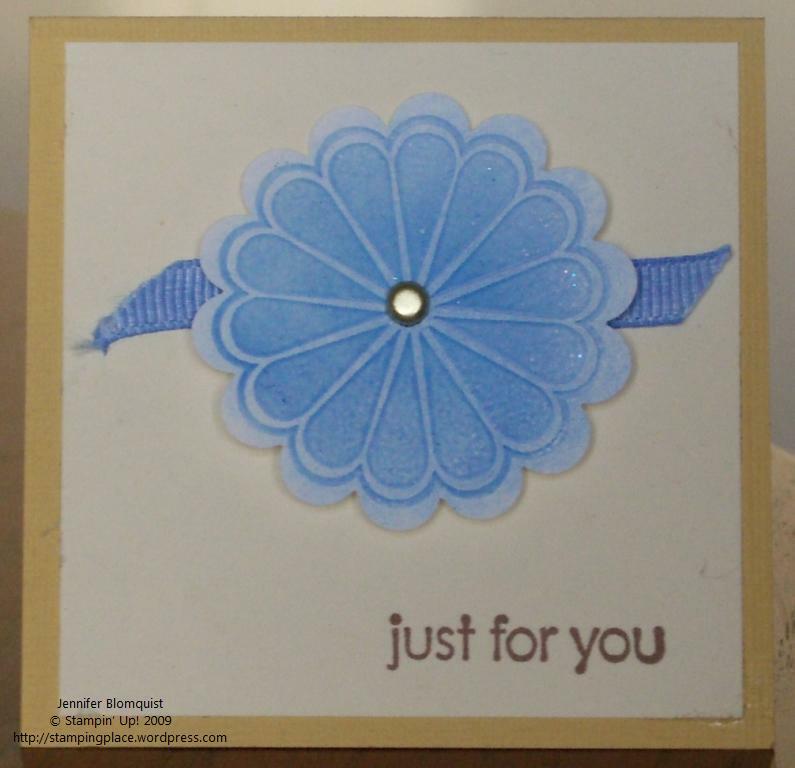 This card was made using the brilliant blue chalk. And with chalks it is very easy to layer colors. One person, used orange as a base color and then used rose red to color the edges. And yes, this is a white ribbon! Use the same sponge to apply color to your ribbon by rubbing along the white ribbon. You can use sealent afterwards to keep it from rubbing off on your hands but it doesn’t rub off much if you don’t. 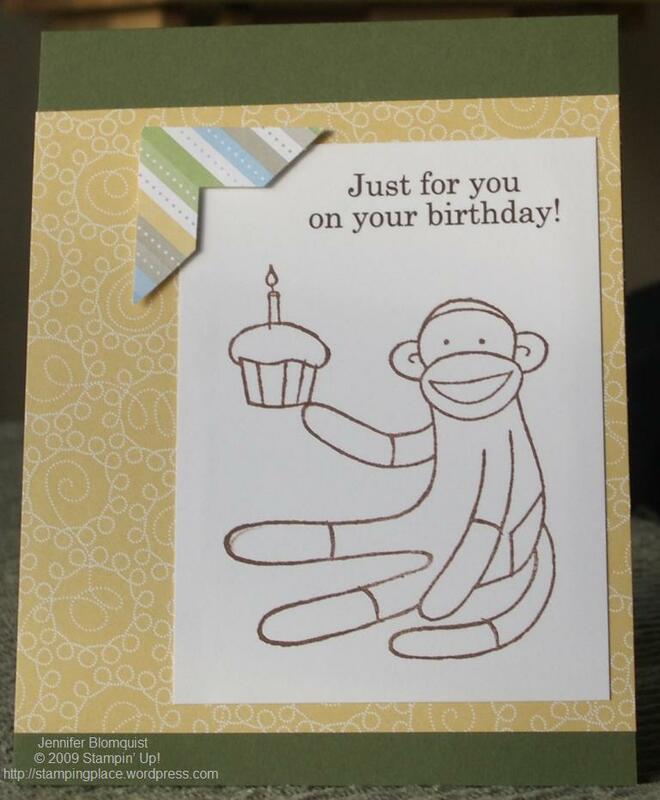 This card used the chalkboard technique where you stamp with white craft ink on a dark paper and then pick up the chalk color using a q-tip or applicator. Once you have the color, you want to tap your stamped image to apply the chalk. Don’t rub or you will have a lovely smear of white and chalk in places you may not want. 🙂 Once you have applied your colors. I tapped off excess power and then use a paper towel to lightly wipe off the excess color. It turns out with a very lovely effect. Well, I’ll be back later with hopefully some new goodies to show you (my occasions mini preorder is supposed to arrive today!) Have a happy wednesday!